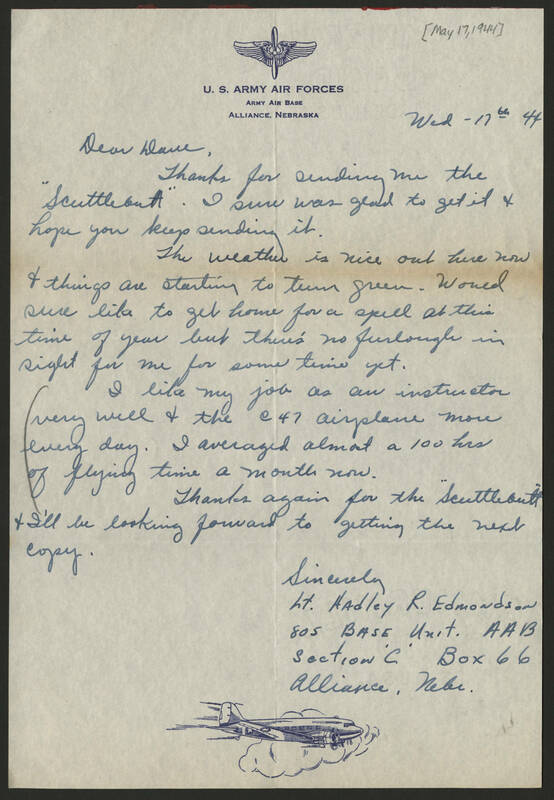 Army Air Base Alliance, Nebraska Wed - 17th- 44 Dear Dave, Thanks for sending me the "Scuttlebutt." I sure was glad to get it & hope you keep sending it. The weather is nice out here now & things are starting to turn green. Would sure like to get home for a spell at this time of year but there's no furlough in sight for me for some time yet. I like my job as an instructor very well & the C47 airplane more every day. I averaged almost a 100 hrs of flying time a month now. Thanks again for the "Scuttlebutt" & I'll be looking forward to getting the next copy. Sincerely, Lt. Hadley R. Edmondson 805 Base Unit AAB Section 'C' Box 66 Alliance, Nebr.